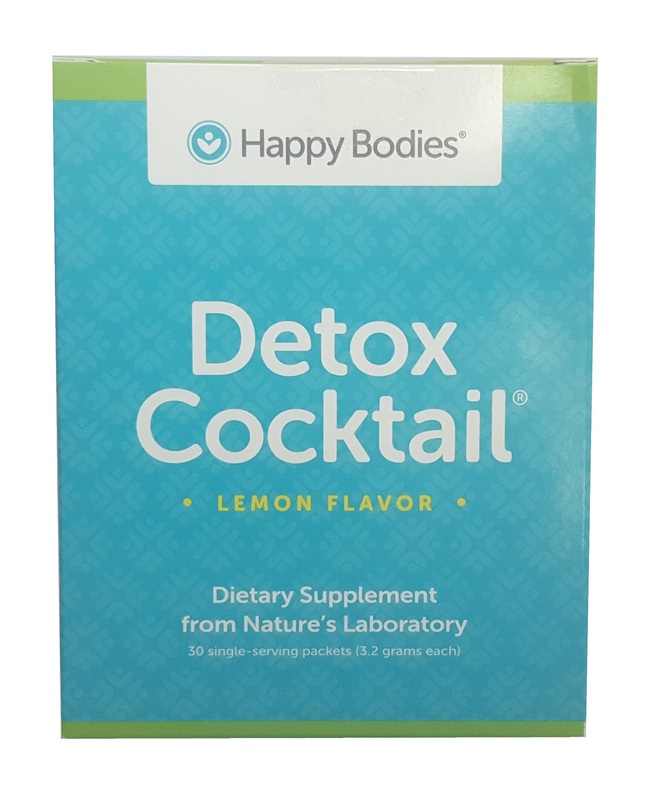 Happy Bodies® Detox Cocktail® is a daily dietary supplement that promotes the healthy functioning of the body’s detox pathways. Unlike other harsher detox and cleansing products, Happy Bodies® Detox Cocktail® is not a one-time chemical laxative. Instead, the Detox Cocktail® is formulated to work gently without disrupting the healthy balance within your own natural detoxification processes. Made with the highest quality ingredients, the Detox Cocktail® promotes healthy liver function and supports daily detoxification for optimal health. The Happy Bodies® Detox Cocktail® daily dietary supplement is inspired by the detox cocktail recommended by Dr. Sherry Rogers in Detoxify or Die and The High Blood Pressure Hoax. It is a blend of Vitamin C (Pure Ascorbic Acid), R-Alpha Lipoic Acid (Stabilized) and L-Glutathione (Reduced) and is the only premixed detox cocktail on the market today. Our Detox Cocktail® was thoughtfully formulated to include both nutrients that are known to be supportive of Phase I and Phase II of your body’s detox pathways and antioxidants that are active in processing free radicals that are generated in Phase I. Prior to the launch of the Happy Bodies® Detox Cocktail®, a consumer would have to buy all the ingredients separately and the cost would be approximately $133 for 30 servings. At Happy Bodies®, you can buy these high-quality premixed ingredients for only $75 for 30 convenient, single-serve stick-packs. Get the convenience of single-serve packs and the highest quality ingredients for only $2.50 per serving versus $4.43 per serving on a do-it-yourself basis without the convenience of our single-serve stick packs! Additionally, if you have ever mixed these ingredients together you know how intolerable the taste can be. We have solved that problem by adding the natural sweetener stevia and organic lemon flavoring, making the Detox Cocktail® a delicious addition to your daily health regimen. Why Take Happy Bodies® Detox Cocktail®? 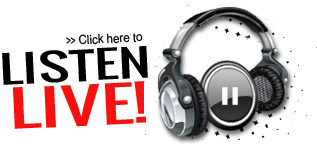 Wellness – supports daily detoxification for optimal health. Convenience – pre-mixed powder with natural lemon flavoring. Quality – manufactured in a facility certified by third-party auditors to be compliant with the FDA’s current Good Manufacturing Practices (“CGMPs”). Purity – no fillers, preservatives, excipients, or artificial colors or flavors. Value – less than half the cost of mixing your own. 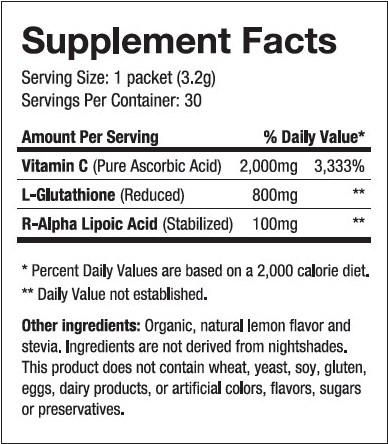 Directions: As a dietary supplement, take one serving per day (or as directed by your healthcare professional) in 8-16 oz. of water or your favorite beverage. Take with or between meals. If you experience excess gas or diarrhea, begin with a half-serving per day and build up to one full serving. Serving Suggestions: While the Detox Cocktail® may be taken at any time of day, Dr. Rogers has suggested that it may be most effective if taken immediately following an infrared sauna session or a couple of hours following your last meal of the day. It is also recommended that you wait two or more hours after taking the Detox Cocktail® before taking other dietary supplements. A Note about Mixing your Detox Cocktail®: Because we choose not to add excipients, fillers, preservatives or flow agents, the Detox Cocktail® may vary in color, taste, texture and solubility from batch to batch. In particular, stevia powder is sticky by nature and, when added to water at cold or room temperature, it may form small clumps. This effect can be reduced by mixing your Detox Cocktail® and then allowing it to sit for a few minutes. The most effective way to reduce the clumping effect is to add the Detox Cocktail® powder to your daily greens drink, healthy smoothie or fresh-squeezed fruit juice. Warning: Not recommended for use by pregnant or lactating women.